The first post-election poll is out, and it is a doozy. 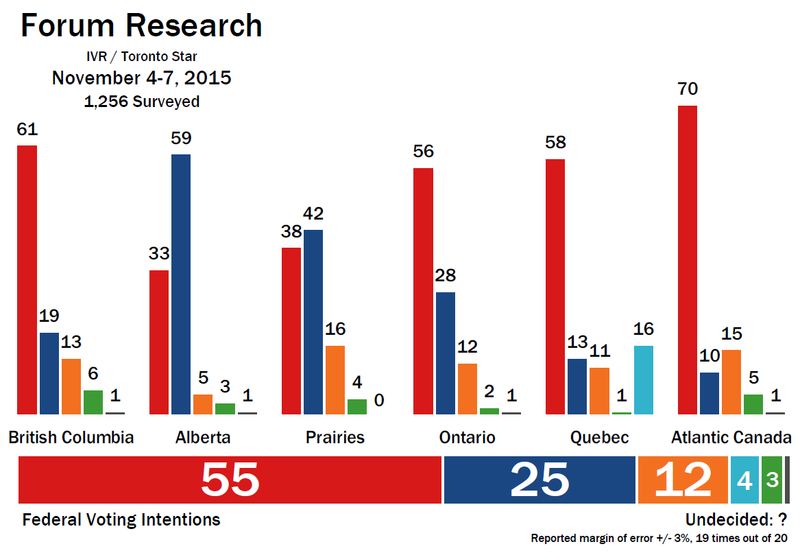 Does a poll conducted four years before the next federal election mean a lot? No. Of course, it says nothing about the next election and, really, has no impact on where things stand today. But it is an indication of how Canadians are reacting to the new Liberal government. And before you say "It's only Forum", remember that Forum nailed the election results almost exactly. Oh, and it marks the first salvo in what will undoubtedly be a barrage of Conservative leadership polling that we will see between now and the date that the next leader is actually chosen. The poll gives the Liberals the support of 55% of Canadians, an enormous number that the Conservatives never managed in any poll throughout their tenure. My records only go back so far and are incomplete the earlier they go, but even back in the days of 2002 and 2003, when the Liberals faced a divided opposition and the coming Paul Martin juggernaut was poised to deliver Liberal rule for the rest of time, the party was only polling at around the 50% mark. The Conservatives have dropped down by seven points to 25%, a number they were flirting with in the dark days of the Mike Duffy scandal. The New Democrats have also dropped by a similar amount, down to just 12%, a score that brings them back to the earliest days of Jack Layton. The numbers in this poll are just astounding: 61% for the Liberals in British Columbia, 56% in Ontario, and 58% in Quebec (the Conservatives, remarkably, are holding firm in Alberta and the Prairies). The NDP takes the brunt of the hit in most parts of the country, down to just 11% in Quebec. All told, these numbers would likely deliver around 245 to 280 seats to the Liberals, with the Conservatives taking 55 to 90 and the NDP less than 10. This poll does not look like a normal honeymoon poll, or at least not like one the Conservatives ever saw after their election victory. The two post-election polls in 2011 taken at about the same time after the vote as this Forum poll (by Abacus Data and Harris-Decima) gave the Conservatives between 38% and 40% support, identical to the 39.6% they managed on election night. Instead, the NDP was up a little to 33%, dropping the Liberals to 15% to 16% support. There was no honeymoon — just a confirmation of where people stood a few weeks earlier, with maybe a little NDP uptick at the expense of the Liberals. The significance of this new poll should not be exaggerated, as its significance is minimal. But there are some worrying signs in these numbers for the New Democrats. Thomas Mulcair's approval rating is now a net -5, after being a robust +17 even in the last week of the campaign. Justin Trudeau has gone from a +9 to a +40, with Canadians approving of him by a margin of 3 to 1. More problematic for the NDP is that a lot of their supporters seem perfectly fine with the Liberal victory. Fully 53% of current NDP supporters approve of Trudeau, compared to 62% who approve of Mulcair. And 18% of NDP voters say they are very satisfied with the election's outcome. That increases to 72% when we include those who say they are somewhat satisfied. Of course, much of this satisfaction could merely be with the defeat of Stephen Harper. And Trudeau is at a very high risk of losing much of this new support if he doesn't deliver entirely on his progressive rhetoric. Nevertheless, the NDP has some work to do to convince its traditional supporters that while Trudeau might sound good to them, Mulcair and the NDP remains the real deal. Perhaps more significant (and we're still talking low significance here) were Forum's numbers on the Conservative leadership race. As he has been in Conservative leadership polling for the entirety of Stephen Harper's time in the job, Peter MacKay was at the top of the list. Among all Canadians, MacKay was the choice for Conservative leader of 29%, more than double the next most popular candidates. These were John Baird and Rona Ambrose at 14% apiece, despite the fact that Baird has ruled himself out and Ambrose has been officially ruled out due to her becoming the interim leader. Next, at 11% each, were two Alberta MPs: Jason Kenney and Michelle Rempel. Scoring below 10% was Kellie Leitch (9%), Tony Clement (7%), and Rob Nicholson (6%). Among Conservative supporters, MacKay was still well ahead of the pack at 32%, followed by Baird at 18%, Kenney at 16%, and Ambrose at 12%. Do these numbers mean much? Not really — as the former leader of the Progressive Conservatives and one of the Tories' most high-profile cabinet ministers he should be expected to have the most name recognition. In fact, it is somewhat impressive that Rempel and Leitch, who were both only elected for the first time in 2011, scored as well as they did, beating out such fixtures of Conservative politics over the last decade or more like Clement and Nicholson. There was some regionalism in the numbers, with the former Nova Scotia MP MacKay scoring best in Atlantic Canada and Kenney and Rempel doing significantly better in Alberta than they did nationwide. And in terms of gains or losses, if any can be determined, it does seem like Ambrose's rise to the interim leadership of the Conservative Party has helped her. The last Forum poll asking the question in May 2014, if we exclude those who were undecided in that survey (as that was not an option in this one), had Ambrose at 8% among all Canadians, compared to 14% today. MacKay dropped from 38% to 29%, while Kenney, Baird, and Clement (the only other names to be in both of these polls) had no movement of any significance. So, possibly MacKay has lost a little lustre in the eyes of Canadians, or there is just too much apples-to-oranges comparisons here to make anything of it. I'll lean towards the latter. I'm not surprised. I wasn't particularly impressed by Trudeau during the campaign, but almost from the moment he won the election he's looked like an excellent choice. He has tons of political capital right now. Let's hope he uses it to accomplish something. 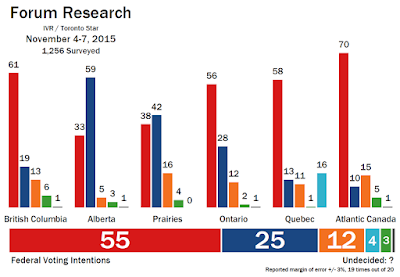 Regarding the eventual CPC leadership race, that poll probably means even less than the general election poll. I doubt McKay or Kenney could hold that party together. Baird doesn't want the job, and Ambrose isn't eligible. I'm still hoping for Maxime Bernier. Funny, no Lisa Raitt, James Moore. I like Diane Finley. Wow! great numbers for the Liberals but, also not very useful to them at the same time. I'm not surprised we often see similar bumps after provincial elections. The cold hard truth: It often pays to have a Government M.P. and I suspect this is part of the inertia or movement we see relative to the election result. This is a very bad poll for the NDP 11% in Quebec and 12% in Ontario is pathetic-these aren't pre-Layton numbers they're Audrey Mclaughlin numbers! If this isn't proof positive that Mulcair must step down for the good of the party I don't know what is? On the plus side the NDP appears to have a roughly 12% hard base in Canada, respectable enough for a third party but a long way from the 25% hard base of the Conservatives( and I would suspect all major parties in parliamentary democracies). So this poll solidifies the NDP's new-old position in Canadian politics. 13% for the NDP in BC is a very poor omen for John Horgan and the BCNDP. If Mulcair refuses to step-down (and from what I understand his stubbornness will prevent his resignation). I think, erven this far out from a BC general election- 17 months, it is a very good bet Christy Clark will win re-election. I will predict Christy Clark will be re-elected in 2017! The Conservative potential leader numbers are also interesting. It sure appears the Red Tories are back. Kenny in fourth place must be humbling and I hope shows the direction the party is heading back toward the centre-right. People talked about how the Reform Party usurped the Tories during the merger, but, they appear to have been much less successful in embedding their ideology within Conservatives throughout Canada. Excellent numbers for MacKay, I don't see how he could pass up this opportunity to run for leader-he's the new popular front runner! Although, Kenny may still have the organisational advantage (which is much less helpful in a long leadership campaign). When MacKay stepped down in May, it was because he wanted to spend more time with his young family. If he were to run for CPC leader now, it would be an 8+ year time commitment. Beyond that, his election as the PC leader was not all that cohesive, and there is no real reason to suspect that's changed in the CPC. Many of us did not believe MacKay's explanation at the time, and still don't. Of course, given his time as leader of the PCs and as a member of Cabinet, not believing something he says is more or less a natural reflex. Peter MacKay is the obvious front runner-as the poll demonstrates he has the support of nearly a third of Canadians and Conservative supporters for the top job. A fairly cohesive beginning for someone who has yet to officially throw his hat in the ring. "A fortnight is a long time in politics" as the saying goes. May was eons ago and long before last week when MacKay gave a well attended and regarded speech to the Albany Club introducing Brian Mulroney. It is hard to view the speeches as anything but a prelude to a leadership campaign and an unofficial or de facto endorsement by Mulroney. MacKay's leadership was cohesive enough for the PC membership to vote in favour of the merger-90% of Progressive Conservative delegates vote in favour! Is that not cohesive? Cohesion (n): The action or fact of forming a united whole. The graphs really tell the story the Liberal and NDP lines are the inverse of one another. This should be instructive to the NDP moving forward. Whatever the political reality: Conservative or Liberal Government, Conservative or Liberal Opposition, the NDP's main opponent in a national and provincial context is the Liberal party, with the possible exception of Quebec. Looking back at the last campaign (hindsight being 20/20 of course) it is clear Mulcair talked too much about defeating Stephen Harper when his real opponent was Trudeau and his main body of support the 70% on the Centre-left of the political spectrum. Mulcair spent too much time showcasing Harper's failures instead of focusing attention on Trudeau's inexperience. Mulcair as the leader and chief strategist should take responsibility for his failures, he has brought the party back 40 years. I expect we will see renewed calls to "unite the left" in the next Parliament. They really should start including Michael Chong in these Conservative leadership polls. He's almost the only one of the pack who has both good name recognition among the public and a good chance of attracting support from beyond the Conservative base (due to his attempt to stand up to exactly what Canadians rejected about Harper, with his Reform Act). MacKay has great name recognition, but I'm not sure his past helps him - he's become somewhat known for mismanaging the major portfolios he's handled. As for Trudeau's ratings, yes, his actions in the first week have been pretty stellar and made a lot of people feel that "finally, change has come". He certainly has a good feel for public opinion. However, there are some really controversial decisions to come with which he can easily disillusion Canadians. For example, the TPP (i.e. America's anti-China economic alliance), which allows corporations to sue Canada in secret courts and which retroactively extends copyright by 20 years. Signing that will instantly disillusion very many Canadians. NOT signing that will make not just major corporations very angry with Trudeau, but also the United States (because the TPP and TTIP are vital US geopolitical projects to contain China and Russia). Plus, Trudeau will have to figure out how he can get his agenda through the Conservative-dominated senate without reneging on his promise to have an "independent" appointment process for filling vacancies. It may turn out that keeping most of his other promises will depend on breaking his promise about the senate. Michael Chong is a bit of a persona non grata within the Conservative Party. His resignation on a matter of principle: He voted against recognition of Quebec as a nation is seen as a partial betrayal(it lead to the impression Chong is not a team player) to the newly formed CPC. Eleven years later his position that Quebec should not be recognised as a nation is not only against party policy but, is problematic for a party that wants to build on the small beach head they have established in La Belle Provence. Good post. Ya, Harper must have giddy to give away Canadian sovereignty and to sign this thing, realizing what a poison pill this would be for Trudeau if he won. If Trudeau does keep it, this may end up killing him with young people, as it will directly affect their lives. The best way would somehow say we need to renegotiate this, as it was done by our leader in bad faith, or we cannot be a part of the TPP. I don't even know if that would be possible. Or somehow convincing Obama or Clinton to kill it, and starting again. If a Republican gets in, we're dead. What Harper did to everyday Canadians in signing this was just disgusting. Both Clinton and Sanders are out against this deal. Expect other countries to also step away as just how bad a deal this is gets recognised !! Why do you want Canadians to pay six times the price Americans pay for dairy products? Are you a multi-millionaire dairy or poultry farmer? Canada is a trading nation, expanding our ability to market our products throughout the world is good for the economy and good for Canadians. The benefits of trade are well known and long lasting. Canada's GDP has nearly tripled since, the introduction of the FTA, as an example. A higher GDP just means that a higher percentage of human activity in a country is measured in terms of money. The most efficient way to increase GDP is to increase the size of the financial sector (which is what's responsible for the GDP growth in the US lately, while all their other industries - and many social markers - stagnate or decline). Look around the world, and you'll see that many of the "happiest" countries have low GDPs. Free Trade Deals are equivalent to taking away sovereignty. By making countries more interdependent, they take away the ability of particular countries to pursue independent policies (the more interdependent a country is, the easier it is for it to be crippled by economic warfare by others who don't like whatever they're doing politically). For example, Russia made its own economy dependent on the West in the 1990s, which in turn allowed the West to sanction it and threaten it with expulsion from Swift for not supporting a NATO-sponsored campaign of ethnic/cultural cleansing next door. Libya stored its billions of dollars in US banks, which allowed them to be "frozen" as soon as the US decided to topple the government. It's not always a bad thing, of course. In Canada's case, we arguably don't need political independence as we're very reliant on the US anyway - if ever the world economy begins to collapse, I'm sure that the US will arrange things so that we're the second-last to be sucked dry. So "free trade" is likely good for Canada, 'cause we don't need sovereignty anyway. But it would be a shame to allow trans-national corporations to sue Canada in secret courts. At least I can trust that the US won't ultimately let Canada collapse unless things get REALLY terrible, but I don't have the same level of trust in trans-national corporations. Many of the happiest countries have low GDP? I doubt it but, I'll check out your theory. If it was true I would expect Syria, Iraq, and Afghanistan to be among the happiest countries in the world and countries such as Russia, China, Romania, Bulgaria and Poland to score higher than their Western equivalents. At the very least I would expect an aberration whereby at least some low income or low GDP countries score higher than some "Western countries". In Chapter Two of the World Happiness Report we see Figure 2.1 refutes your claim that "many of the happiest countries have low GDP. Figure 2.1 (p.20) shows the happiest countries in the World are the Northern Developed Nations. Your comment demonstrates the problems of socialism: It only works if one disregards human nature, economic truths or norms, high moral and ethical values and the desire for peace. Trade fosters peace and democracy. Your anti-Trade neo-Republican American style Xenophobia promotes nationalism and bellicose relationships. What is it like back in the 19th century? Your idea that the more interdependent a country is through trade the easier for its enemies to cripple it economically is simply laughable. So a country with a diverse range of trading partners is more susceptible to economic shocks than a country without diverse trading relationships? Don't be ridiculous. What you write about Russia is not historically correct. The Russian economy was not dependent on the West during the 1990's. There was an influx of Western Capital as the Russian establishment sold off state assets at bargain prices (to enrich themselves), then, with the rise of the price of oil Russia became entwined within the larger global resource development economy. If anything Europe is dependent on Russian gas exports-not the other way round. Western sanctions were imposed due to Russian illegality and its invasion of the Crimea (Wow-an apologist for Putin)! NATO is not involved in a " campaign of ethnic/cultural cleansing". In fact the UN just released a report condemning DAESH for engaging and executing genocidal practices. I am quite disguted you would make such unsubstantiated hateful comments about NATO and by extension Canadian service men and women. Trade agreements do limit national sovereignty but, do so while increasing a country's wealth and standard of living, a trade-off most rational people are willing to accept. Your anti-Americanism is extremely disagreeable. Do you even realise Canada was partially founded by Americans? I wonder if there is enough support out there for a Reform-Conservative party and a separate Progressive Conservative party ?? Because I think if they don't split but stay with the Harper-Reform setup they will just get smaller. If we end up with the LPC going forward with an IRV system, there would be more incentive for them to demerge. No more worrying about "splitting the vote". Having the right divided ensures Liberal rule forever. We've seen how that goes. IRV systems still split the vote! This is why the Liberal Party and the National Party of Queensland merged in 2008 to form the LNP. The merger occured as Labour had been in government since 1986. Following on these lessons and the history from 1993-2006 I find it highly unlikely and very wishful thinking to believe the Conservative Party will resort to its previous divided arrangement. Just to note, Queensland's right-split issues were related to the fact that the state had something called "optional preferential voting," which allowed voters to avoid choosing second preferences if they wished, as if they're voting in a FPTP election - and that tended to happen a lot despite the parties being in a coalition. So the Queensland situation isn't the best example. Otherwise I agree - it would take something major for the two halves to split again, and ideology isn't it. If we're honest, we all know there isn't enough cracks ideologically between the two halves to see daylight through. People liked to pretend the Reformers and PCs were ideologically dissimilar, but honestly it was much more a question of regional interests than one over political philosophy. New Zealand is Mixed Member Proportional, so not a great example of IRV. A much better example is the Irish presidential elections. In 1990, the second place candidate from a FPTP system one under IRV due to support from third parties. As a Red Tory, I do hope for another day in Canadian politics where I can vote for the party that I like the most rather than just voting for the party that I dislike the least. No. That is not what happened in the 1990 Irish presidential election, although your sentence structure is difficult to understand. The 1990 Irish presidential election is notable in that the candidate with the most votes on the first ballot lost. This is unusual in systems with single transferable vote and Irish politics in general which uses multi-member STV to elect M.P.s. I re-read my post and it's poorly written, but it shows the different results between a FPTP system and a run-off system. Often it doesn't change things, but when there is large secondary support, it does. That was a major criticism of the Harper Conservatives (along with low voter turn-out). Your previous statement doesn't show anything! You provide no data or evidence to prove your point or any assertion, accusation, theory or hypothesis. "In 1990, the second place candidate from a FPTP system one under IRV due to support from third parties". Firstly, the comma after 1990 is not needed. Secondly, it does not show the difference between FPTP and a run-off system, Ireland uses a run-off system not FPTP to elect their president! Thirdly,It is incorrect to say the first round equates to FPTP since, the top two candidates in effect "win" whereas under FPTP only the leading candidate wins. Thirdly, it is wrong to assume any candidate in the 1990 Irish election had "strong secondary support" since, there is no way in retrospect to measure. In both rounds one is asked to vote for one candidate, therefore, one has no way to gauge "secondary support". Clean sweep, anyone? That's more than 80% of the seats! But I think people are very much on a "Harper's gone, Trudeau's change" positive vibe and it may last a little while. I think things will be more meaningful in at least six months, maybe even a year. If these numbers hold up then, then Trudeau is doing a great job at riding his wave and keeping people satisfied with his government. It's informative that even with 55% nationally Trudeau doesn't sweep Ontario like Chrétien did in 1997. It really shows how much Chrétien benefited from the divided right. The "low hanging fruit" are quickly getting picked. It is heartening to see that Canadians recognize the moves of the Liberals to date as very positive, but they were relatively easy moves, telegraphed some time ago, and did not involve either nuance or controversy. The House begins sitting on December 3, the refugee issue has now become one of logistics rather than aspirations, the TPP is a major headache, and hard climate change targets will not be a easy to shepherd. Democratic reform has to begin almost immediately after the House sits, and that will be one of the toughest tests, because success will mean getting the opposition parties to agree to something they don't like, or getting the Liberal caucus to agree to something they don't like, or both. Having read Barry Cooper's immature and self-serving comments about the election, and seeing that even now, Alberta remains outside the mainstream, I think this is an issue that Trudeau would be wise to start solving sooner rather than later. Within minutes of the Liberals declared winners, there were those who wanted to immediately return to the days of Alberta separatism. It's not rational, but it is real. Peter MacKay would be my last choice for leader for a variety of reasons. Personally, I don't care if the politician is left, right, or center so much as they are honest and have a high degree of integrity. I know your model is being reworked, but what seat forcasts would your existing model produce on these numbers? I think the Conservatives in the west need to wake up, as they have been spoiled by the last 10 years and really don't have a concept of what Canada thinks as a whole. The last 10 years were an aberration, starting with the complete dysfunction and total lack of leadership in the Liberal party. I think this poll is really good for them to see, as they might start understand the reality of the mountain they have to climb to get back into power. I read so many posts from average Conservative supporters that sound like they are directly out the United States, with no concept of what most Canadians think. It's really pretty amazing. People seem to have forgotten that even Liberals weren't sure of Trudeau at the beginning of the campaign - and maybe some didn't even like him. Imagine what the election results would have been if Canada had some confidence in Trudeau the last two years. Quite insulting if you ask me. Just because we as conservatives didnt fall for that pretty face doesnt mean we should be associated with US conservatives who are, mostly, complete idiots. Canadian conservatism is nothing like that in the US. I read comments like yours above and I think; Herein lie the seeds of the Liberal Party's destruction. Some Canadians agree with conservatives in the US. Get used to it! If you really were liberal you would accept differences and plurality of thought. Instead your writing criticises others for their opinions exercising liberal values and are very much reminiscent of some in the American Republican Party who wish for uniformity of ideas and philosophies. You Sir, are the Republican accolyte. Just as certain Republicans only want to let in Christian refugees, your value based judgement aatempt to limit debate to those who share your opinions, it is an authoratative and autocratic style myopic and borderline un-Canadian. You write as if thinking differently from the norm or the majority is wrong, when in fact such thoughts are the very basis and essence of Canada, you write as if you have " no concept of what most Canadians think. It's really pretty amazing". Capilano, I would write to that your post is the seed that leads to the total annihilation of the Conservative Party of Canada as we know it. We had an economy that was much better off than most of the industrialized world and voters knew it, we had very low unemployment, especially compared to the last three decades, we had much lower taxes that were promised and delivered to all Canadians, and the Liberals had a leader they didn't care very much for. And yet somehow, through all that, unlike any government under those circumstances in the history Canada, in fact not even close, the Conservatives lost. And in almost every single survey since, the number one reason: values. I'm not a Liberal. I'm a former federal PC. And until Conservatives in the Alberta and Saskatchewan figure out that what Harper tried to pull, in all his pandering policies towards far right wing social voters, that this is completely unacceptable to the rest of Canada. It will be the Conservatives as we know them that will be gone, maybe forever. Conservatives can do what they want. It's a free country. Personally I think it's important to have a strong conservative opposition to keep the Liberals in check. But no chance with this bunch. And remember, even in this good economy threehundredeight still had them at 33% in their highest poll during the election. I am now a full time ABC voter where millions of us reside. And until the far right wing reform voters understand that, they'll never be in power again, especially with the election laws changing. So it's you who has to figure it out, not the Liberals. Many of us are who are not Liberals, won't be voting for any form of this Conservative party. Ever. To call people with different policy ideas "American and anti-Canadian (sic)" is in itself an act directly and permanently opposed to Canada and Canadian values not to mention the values of both the former Progressive Conservative party and the Conservative party of Canada. That statement alone shows you have more in common with Islamic State than Canada. IS more properly DAESH, differentiates among human beings. Canadians accept human beings in all their differences, Canadians respect and accept that some people may share opinions, ideas and policies with America and Americans and that is fine and part of this great country. People who oppose new ideas share their point of view with Xenophobes such as those who wish to limit immigration to certain religions. Just as some reject Muslim refugees, you reject American ideas without a fair trial. It's true you are not a liberal, your ideas belong long before the dawn of liberalism back in the Dark Ages when accusations were as good as guilt, where tribalism and sectarianism ruled and politics was controlled by the few. it is an impoverished viewpoint. We don't want people like you in the Conservative party because at the end of the day your confused loyalty does no one any good. I am not afraid of change and I expect the Tories to change at least some of their policies after this election. Will such change be enough to win the next election noone knows, but, it is far better than labeling those who you disagree with as "pseudo-traitors" as you seem more than willing to do without cause. I am sorry your ideas fall to dust under scrutiny, perhaps if you took more time to think you would avoid careless mistakes such as "Lisa Ambrose". and "Yet millions of us have walked away from the Conservatives, maybe forever". Well the Tory vote only fell by 300,000 votes between 2011-2015. But, keep dreaming, it's the only way your fantasies hold a semblance of truth. "That statement alone shows you have more in common with Islamic State than Canada. IS more properly DAESH, differentiates among human beings." "Just as some reject Muslim refugees,"
Are you serious with that? You just totally destroyed any argument you had with reasonable easterners. This is actually pretty scary that you could think like this as a Canadian. My gosh. Where do you get this from? Wow, simply, wow. This is Canada. Our right wing party was called the Progressive Conservatives for a reason. And contrary to popular far right wing beliefs in many circles in the west, it was very much in tuned with eastern Canada, and both ideas could easily co-exist. In fact the provincial PC's in Ontario won for 43 straight years, knowing that right wing business ideas, along with left of center social values, emphasizing a strong education and health system, was a very compatible way forward. No matter the governments that came after it, those years set Ontario up for a very good future. I personally have no problems with many ideas coming from the United States. But many of those coming from the far right of the Republican party, which would be just off the far right wing scales in terms of the Canadian political spectrum, are against most in the east's basic moral values. The fact that Harper, after being elected to majority mainly because of winning in Toronto, pushed those far right wing American social values onto Canada, that was his death nail and maybe the end of the Conservatives. As I wrote on here on this site in July, there was simply no way that Harper was going to win more than 40 seats in Ontario. He was down by 10 - 15 points in every poll in Toronto and most of urban Ontario right from the very beginning, and even well before the Liberal's surge. To compare people who are quite right of centre economically, but left of centre socially as people who would have the same beliefs as Daesh is just unbelievable and quite honestly self-suicide. It's exactly why the Conservatives are going to get killed in 2019 if this keeps up. Your problem is a great majority of voters from Thunder Bay east would consider themselves right of center economically and left of center socially, while they completely rejected Harper's American far right wing social thinking. Many of those voters would identify as PC and live in urban Ontario. And in the very end, that you would compare us quite right of centers to ISIS??? explains why the Conservatives are so so much in extreme trouble. To say millions of us who think like that are somehow wrong and in the dark ages, explains everything. But I have to say I really appreciate your candor. It really explains a lot of how people are thinking like you are these days. Thanks. This is Canada. Our right wing party was called the Progressive Conservatives for a reason. Yes because the Conservative party merged with the agrarian Progressive Party in the 1940's. The Progressives were really more of a Farmer Lobby than a political party structured either on the left or the right of the political spectrum but, certainly could be classified as a manifestation of Prairie populism. I am afraid I can not respond more fully. I find your writing much in need of improvement, to me it is incomprehensible and so, I am unable to make further comment as I am not able to understand your intentions, meanings, opinions. But I will clarify one thing: I am only comparing you and your writing to DAESH. Since, you use "American" in a pejorative context and disqualify American ideas based solely on their origin describing them as "Anti-Canadian" (sic). LOL. Typical of people who get killed in their argument that they attack the writing. It's pretty easy to understand in context of what I was trying to say. Sorry, but not even a good try. I know exactly how the PC's came to be, but I also know what they practically came to be. They were also very progressive in social beliefs in the east, and heck, even in Lougheed's Alberta. We're Canadian, not American. Many of the far right social Republican beliefs are against the basic human morals of many of us in eastern Canada. Even the fact that you defend them, pretty much says everything. Nothing more needs to be said. If we disagree that strongly, Matt, then perhaps we shouldn't share a government at all. My question is if McKay is elected CPC leader where does he go for a seat? Quebec? Ontario? Who would be likely to give up his or her seat. Good question. My guess is that Nicholson will give up his seat in the safe riding of Niagara Falls. Too bad Orchard doesn't have a seat! My best guess bet is that Nicholson will step down and MacKay will run in Niagara Falls. I would actually guess Harper in Calgary would give up his seat. This makes the most logical sense and the CPC could run a dead cat in that part of Calgary and win. I doubt Harper will remain a M.P. long enough for MacKay to run in a by-election. If the leader is not selected until Spring of 2017 Harper may well have left for greener pastures already. I think MacKay or whoever becomes leader will want to seek a seat that reinforces or reintroduces Tory strength in Ontario. It is one of the reasons I think an Ontario candidate is likely to emerge. MacKay may well decide to run in the Maritimes if a seat is open or perhaps even B.C. since his wife is from Vancouver. A seat like Vancouver-Quadra might be winnable for MacKay. The Tories need a leader who represents a riding somewhere other than Calgary. Harper's seat is no good, as is Jason Kenney's. As long as eastern Canadians keep thinking of them as the Reform Party, they're not going to win again. The Tories need an Eastern leader. The West had their guy in for 12 years, it is an Easterner's turn. it's why I think if MacKay for example wins the leadership he'll seek out a by-election seat East of Manitoba, to cement the notion the Tories are a national party. Cap you are making again the standard mistake. There are TWO Tory parties. The Western/Harper version and the Eastern/Mulroney version. Like it or lump it they are significantly different. Can you say Reform vs Progressive ?? McKay has too much PC baggage. The Reformers won't support him. They'd find Bernier far more palatable. What you are seeing in this poll is the high point of approval of the Trudeau government. Why?? Because the only things that have been decided( long form census, unmuzziling scientists) are non conversational. When the big decisions start getting made ( Bombardier, HoC and Senate Reform, electoral reform, etc )Trudeau's support will start to fall.. I would bet within a year his approval will be somewhere in the mid forties. To whom much is given much is expected.Managing those expectations will become Trudeau's biggest hurdle. Most likely this is the high water mark. At one point in the late 1980's Mulroney's approval was close to 60% albeit briefly. By the time his tenure ended it was in the mid-teens with his disapproval rating edging toward 80%. This won't last. I agree within a year he'll be lucky to have an approval rating in the mid-forties especially if he carries through on his promises. How can any poll be taken seriously about the permanent Conservative leader not have Lisa Raitt's name on there? Even my French speaking right wing friends from Quebec like her. I have to say, I don't think the Tories should choose Kenney or McKay as leader. Kenney clearly represents the party's Reform wing. McKay clearly represents the old PCs. Neither of those is the way to go. They need to forge a new Conservative brand with none of the baggage from those old parties. Which is why I support Maxime Bernier. I wouldn't exactly call Max a cabinet star. Would you? I think your first part there Ira is dead on. Not so sure about Bernier though. I think they need to not use any one with ties to either of the old party versions. He's a terrific orator. His ideas are unlike those that came before him. I want to see a true libertarian in that job. Support for individual liberty (and an implicit rejection of collectivism) is the main thing the Reformers and PCs had in common. They should focus on that. I'd also love to see what would happen if a large economy like Canada adopted a fixed money supply. Are most Canadian Conservatives Libertarians? I don't think so. For one thing, a lot of Conservatives recognize that Libertarianism is logically incoherent. "Libertarianism is logically incoherent. " You mean like Conservatism then ? Incoherent how? Are you going to argue that individuals can't be free when they have unequal levels of economic power? I would argue that the opportunity to hold unequal economic power is essential to individual freedom, as it is the only way for the idiosyncratic to direct the market. Peter has the stronger point. What's becoming known as mainstream conservatism (especially in the US) is incoherent. Libertarianism helps fix that by eliminating the values-based authoritarianism (the religious right). "Libertarianism helps fix that by eliminating the values-based authoritarianism (the religious right)." In actual fact Ira the religious right has immense influence and control over the very right, right wing of the Republican Party. Don't ever, in the USA, deny the importance of the insane Religious Right. Almost as bad as Isil !! Doesn't this make Libertarianism itself a values judgement? I think the only person I see right now as being able to win in 2019 is Lisa Raitt. Yes, her French isn't great, but she suddenly turns 40 seats in Ontario, 20 seats in the Maritimes. and 18 seats in BC into a battle gound right away, let alone all the seats in the Prairies. And her economic stances jibe perfectly with right of centers in Quebec. If the Conservatives go right wing, they're dead. This last election was a "false friend", and Ontario and the Maritimes will simply not forget it. You mean like Conservatism then" ? Much more akin to your general style of writing Peter. I know they do, Peter. The Republicans are almost anti-Libertarians, openly proclaiming things like Muslims should be allowed to be President and Atheists shouldn't count as citizens. @Capilano Dunbar - But it's not authoritarian, which is the point. But the question nobody wants to touch apparently is where is the NDP going and likewise Mulcair ?? Mulcair seems to want to keep being leader. He's content to be Alexa McDonough, it seems. If the NDP allows that, then they're content to remain the third party. I tend to agree with you Ira. Remember that their big win was because of Layton in Quebec. Mulcair comes later. And simply hasn't got it !! The NDP may be the real deal, but Tom Mukcair certainly isn't. He isn't the kind of lifelong, dyed-in-the-wool social democrat that is the core of the NDP's base, but an opportunistic defector from the Quebec Liberal Party. The NDP would be better off rid of him. But that is the problem with the NDP. The NDP leadership and senior management is not working class. Layton came from what may be termed the "Canadian gentry" since, both his grandfather and father were cabinet ministers, Mulcair is a lawyer, many of their candidates were party hacks or lifelong NGO administrators/ professionals. It is a sad reality but, the NDP is an establishment party, no different from the Liberals or Conservatives. Of course Mulcair must go but, the NDP needs bold policy ideas to differentiate themselves from the Liberals. Of course one only needs to look at the imploding Labour party in the UK to see the dangers(I wonder if the Labour party will survive until 2020 it doesn't look like it at this end) but, it may be their only hope.